8-Ball vs 9-Ball Pool: What’s The Difference? When it comes to the game of pool, there are several fun variations, the most popular of which are the games known as 8-Ball and 9-Ball Pool. And while there are several similarities that are common to both of these games, there is also a world of difference between them, including the rules and the number of balls that are in play at any one given time. To help you better understand these two popular pool games, below we will start by briefly summing up the few similarities they share. We will also explain the games of 8-Ball and 9-Ball in great detail—the rules, style of play, etc.—and sum up the differences between the two games. Although the rules associated with 8-Ball and 9-Ball are very different, the basic equipment is generally the same. Here are just a few similarities shared by the pool games known as 8-Ball and 9-Ball. Although the term “pool” is often used interchangeably with the term “billiards,” this is actually a mistake. Without going into all of the specifics here, billiards, also known as Carom Billiards, is a very different game than pool. Moreover, it is played on a very different kind of table. Billiards is played on a table that typically measures 10 feet by 5 feet; and a billiards table has no pockets. 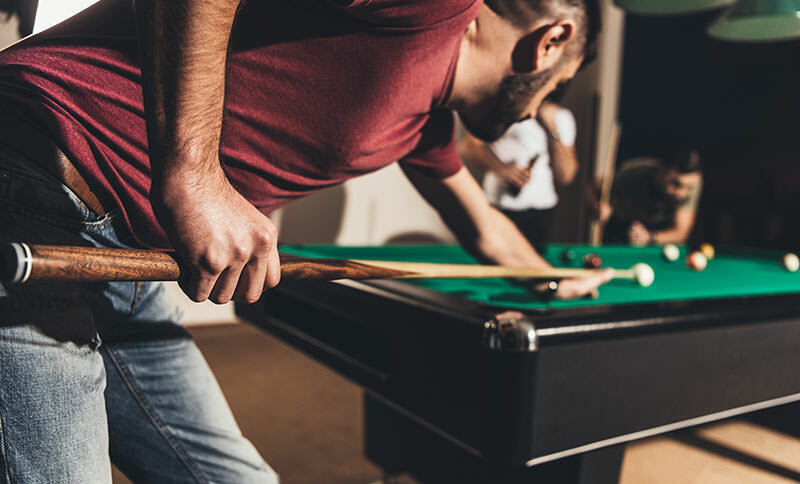 8-Ball and 9-Ball are both played on a pool table—a table with six pockets—and the object of both of these games requires players to hit balls into those pockets. A pool table is rectangular in shape. It has pockets in each of the four corners—called the corner pockets—and a pocket on either side of the table that is placed exactly midway on the long side of the table. 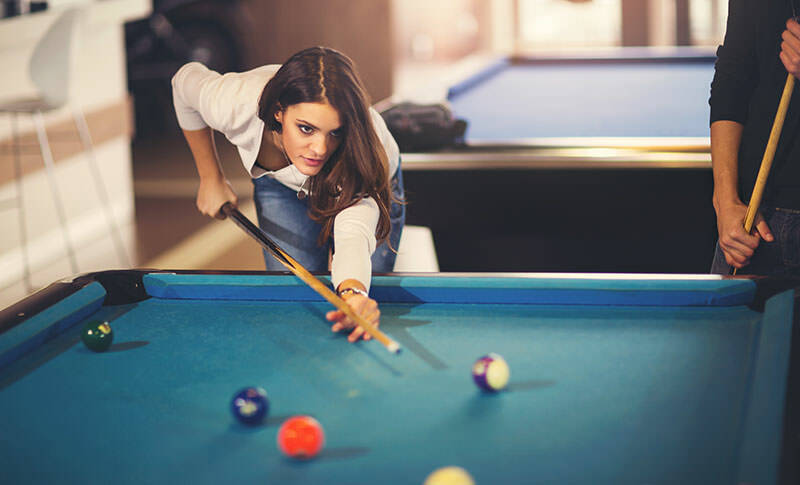 Pool tables can come in a variety of sizes—and both 8-Ball and 9-Ball can be played on any size pool table. Here are the various sizes in which pool tables are manufactured. Bar pool tables. Bar pool tables, named so because they can usually be found in bars and pubs, are the shortest of all pool tables. They usually measure about 7 feet long and about 4.5 to 5 feet wide. These tables were invented as a way to conserve space in smaller drinking establishments. Recreational pool tables. Recreational pool tables are also known as “home” pool tables. That’s because these tables are the types typically bought by private individuals. Recreational pool tables usually measure about 8 feet long and roughly 4.5 to 5 feet in width. Regulation pool tables. Regulation pool tables are the tables used for most amateur and professional competitions and tournaments. The largest of the three pool tables, regulation pool tables always measure exactly 9 feet in length and 4.5 feet in width. Again, both 8-Ball and 9-Ball can be played on any size “pool” table, but neither of the two games can be played on a regulation “billiards” table. Just as the table is the same for both 8-Ball and 9-Ball, so, too, is the type of balls used to play the two games. Although the number of balls used to play 8-Ball and 9-Ball is different, the types of balls are the same—standard or regulation pool balls. Regulation pool balls are made with a diameter of 1-1/4 inches and are manufactured to weigh between 5.5 and 6 ounces. Another similarity shared by both 8-Ball and 9-Ball is that they both involve hitting a cue ball into the object ball. The cue ball used for both games is solid white in color to distinguish it from the colored object balls. Both 8-Ball and 9-Ball involve hitting the cue ball with a pool cue, also known as a pool stick or cue stick. The standard pool cue measures between 52 and 58 inches in length (although shorter cues are available for youth play). The weight of the pool cue can vary between 16 ounces and 21 ounces, and there are also pool cues in half-increment weights (18.5 ounces, etc.). The most popular pool game in the world, 8-Ball is a game that is played with 15 balls in addition to the cue ball. In 8-Ball, there are two opposing sets of 7 balls and one black ball—the 8-Ball. Of the 15 balls on the table (not counting the cue ball) the first 7 balls, which are numbered 1-7, are solid in color; while the remaining 7 balls, numbered 9-15, are striped. There are many different international and national bodies that govern the rules of 8-Ball. These rules, which can be found easily with an Internet search, cover the finer specifics and details regarding the game of 8-Ball. However, for the purposes of this article, we will instead just explain the basics of the game. At the beginning of a game of 8-Ball, the 15 balls are placed into a triangle shape with the help of a triangular rack, and the point of the triangle should be facing towards the far end of the table. Typically, the 8-Ball is placed in the very center of the triangle. Once the balls have been arranged, the rack is removed and the balls are ready to be broken. Player 1 will begin the game by breaking the rack—hitting the cue ball into the balls and spreading them out over the table. If Player 1 makes a ball into one of the pockets of the table on the break, his turn will continue until he misses a shot. Moreover, if Player 1 makes a solid-colored ball on the break, he will then shoot at the solids—and only the solids—for the remainder of the game. The same holds true if Player 1 makes a striped ball. However, if balls of each variety (solid and striped) are made on the break, Player 1 can choose between the solid and striped balls. Assuming Player 1 makes a solid colored ball (1-7) on his first turn, he will continue shooting at the solid balls until he misses. At that point Player 2 will assume control of the table, shooting at the striped balls (9-15) until he misses. The game continues on this way until one player makes all of his 7 balls, followed by the 8-Ball, at which point he is declared the winner of the game. What is VERY important to understand is that the black colored 8-Ball cannot be pocketed until the end of the game—until one player has made all of his striped or solid-colored balls. If a player accidentally hits the 8-Ball into a pocket before he has pocketed his respective 7 balls, that player automatically loses the game. The only exception to this rule is when the 8-Ball is pocketed on the initial break. Should that happen (and it’s rare), the player who broke the balls is immediately declared the winner. Nine ball is a very popular game in the United States, second only to the game of 8-Ball in terms of popularity. Unlike 8-Ball, which utilizes 15 balls + the cue ball, 9-Ball, as the name suggests, uses only 9 balls + the cue ball. This includes all of the solid-colored balls (1-8) and the striped 9-ball. At the beginning of a game of 9-ball, the balls are arranged into a diamond shape using a rack designed for this purpose. 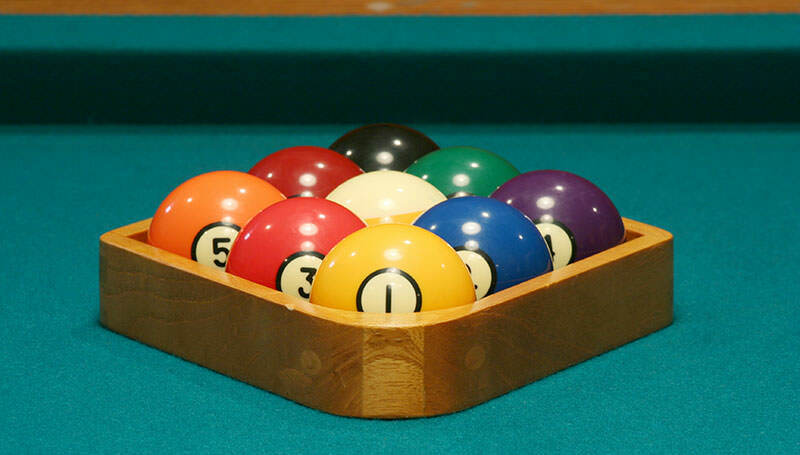 They are not placed in any order, but depending on the table rules in your specific region either the 9-ball or the 1-ball must be placed into the center of the rack, with the other ball placed at the very back end. As with 8-ball, once the rack is removed in 9-ball, Player 1 will break up the balls using a cue stick and the cue ball. If he makes a ball on the break, he will continue his turn, but if he misses, Player 2 will assume control of the table. The game of 9-ball can be ended in one of two ways. First, if the table has been cleared of all the other balls—1-ball through 8-ball—leaving only the 9-ball on the table, a player can win by sinking the 9-ball. The second way to win is through a “combination shot,” in which a player hits the next ball in order—say the 3-ball—into the 9-ball and sinks the latter. Because of rules like “ball in hand” and combination shots, 9-ball can be a very strategic game. One example of this is as follows: If Player 1 has no clear path for pocketing the next object ball, he can choose to play defense instead—trying to place the cue ball into a position that limits his opponent’s next shot. To sum up the differences between 8-ball and 9-ball, remember that the former is played with 15 balls and the latter uses only 9. In 8-ball, the object is to hit either the striped or solid-colored balls (but not both), followed by the 8-ball, whereas in 9-ball you must hit the balls in numerical order, followed by the 9-ball, or try a combination shot that knocks the lowest-numbered object ball into the 9-ball and pockets the latter. Remembering these key differences can start you on your way to mastering either of these two enjoyable pool games.